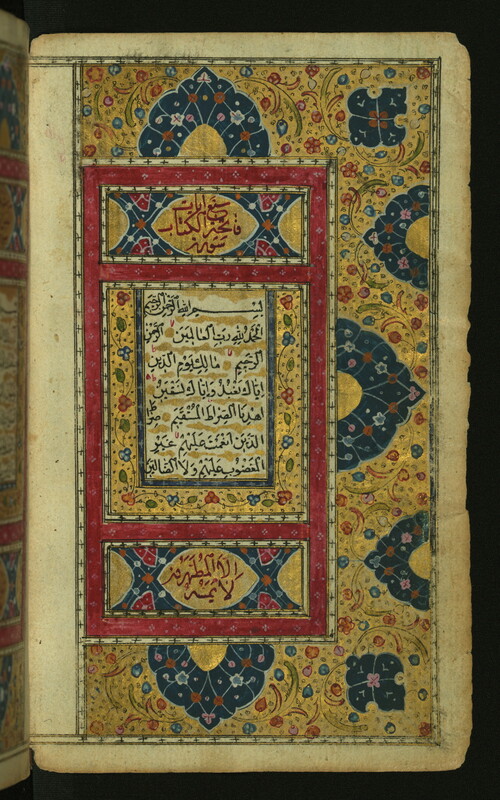 Toward the end of last week, I sat down to look ahead at my teaching topics for this week, looked at the syllabus for my World Literature I course (antiquity to early modern), and realized that I had scheduled the Qur'an on 9/11. When I had made the schedule weeks before, I had taken my pre-made template and populated the empty slots with the reading trajectory that I imagined for the course, without regard for dates--more concerned with overall and weekly organization. At first, I was daunted by the prospect of teaching the Qur'an on the historic date that had practically introduced American culture to Islam through an international tragedy; eventually, I came around to hoping that it would be a good opportunity. Courtesy of The Digital Walters. As it turns out, the class went wonderfully--thanks to great students. They were engaged, interested, and some of them knowledgeable about the Qur'an and Islam from previous reading (on their own or in other classes). They identified the nuance of the Qur'an as a religious text, acknowledging the complicated nature both in comparison with and distinct from some of the other world religious texts we've read over the past few weeks (the Hebrew Bible, Christian gospels, Confucius' Analects). Discussion was lively. About halfway through the class, the elephant in the room finally reared up when students began to confront multiple interpretations of certain passages in the text itself, the historical spread of Islam, and themes of militant conversion in both the text and the history of Islam--and in the history of world religions more generally. I took the opportunity to underscore one of my key goals in the class: to instill a sense of diversity and sympathy for world cultures and various representations of what it means to be human. I was honest: I told them that I had no idea about the date when I had put the Qur'an on the scheduled, but that I thought it was a good opportunity for rethinking and revising some of our assumptions and expectations on a day when those thoughts may be very present in our minds. I told them that we had to understand culture and literature through interpretation; that we had to understand cultures not as monolithic (there is no single "Islamic culture" just like there is no single "Christian culture"); that all of our readings and discussions lead us to consider diversity and sympathy. As I said all of this, I watched as they took in what I was saying--nodding, smiling, taking notes, agreeing. They chimed in, echoing some of my words, extending my ideas, and our discussion turned to reflections on how we live in a moment ripe with possibilities for cross-cultural, multi-faith, ecumenical conversations. It gave me hope, and one more reason to remember why I love teaching. Great post! And very interesting; I had a similar experience this summer teaching medieval history through movies. The week I scheduled for the Crusades and Kingdom of Heaven (a problematic movie but great for prompting discussions) turned out to be the week that the fighting in Gaza really ramped up. I was nervous that it would be a very tense few lessons, but my students were open-minded and thoughtful in our discussion. It's great to be surprised in such a way when teaching! Thanks for sharing such an informative post. You can learn Quran online from School Quran also, it is one of the best online Quran class.